To use MOAP (Media on a prim) in OpenSim you need a viewer that can show this. The viewer needs to have a so called 'webkit' built in, to show a webpage or any other media on the side of a prim. This webkit is not always the same, like the Singularity viewer until recently had an older version that did not really work great with https formatted websites and gave some kind of SSH error. Now it is up to date, like the Firestorm viewer for OpenSim, both are now capable of showing many sites so the webkits are updated to the latest version. I tried some educational websites, to see if it was possible to use educational webcontent on our 3DLES EDUgrid. First on my list was Voki, a website where you can create talking heads for free. This can be a very handy tool to have some item in your virtual world explained. So I created this character that welcomes new visitors in the virtual world and explains a bit what the visitor can do here. 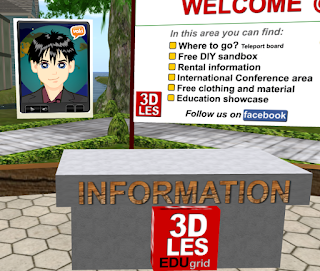 On the right you can see the working version and below a picture of the voki in the 3DLES virtual world. In order to get this working on the prim I only had to copy the given link of the Voki to the media settings of the prim side and change the settings of the horizontal and vertical scale and offset, so that it fits. And I did not want to show the control bar over this prim so I untagged this option. The learningapps website offers all kinds of quizzes that you can create for free. These 'apps' can also be placed on an object in the virtual world, and they can be controlled by clicking with the mouse. So a student can do any interactive quiz in-world. Also embedding youtube video's is an option that can be done quite simple, the only thing that needs to be changed is the URL of a video so it will be fullscreen (embedded). You can do this by copying the link of a video and replace /watch?v= in the URL to /embed/ so the url should look like this... https://www.youtube.com/embed/NKzcSoD-QCc Below you can see how this looks in the virtual world.